We’re super excited that this year, AutumnWatch is coming to us from the famed autumn wonderland that is New England in the USA. We feel inspired to share with you some amazing autumn and winter pallet projects that are good for the environment, will help your favourite garden visitors survive the winter and will help you join in on your own personal AutumnWatch in your garden this year! Who doesn’t love hedgehogs? Autumn is a great time to see these delightful little critters. Now we can’t promise hedgehogs, but if you know you’ve had hedgehogs in your area the past, this could be the easy and animal-friendly pallet project for you! 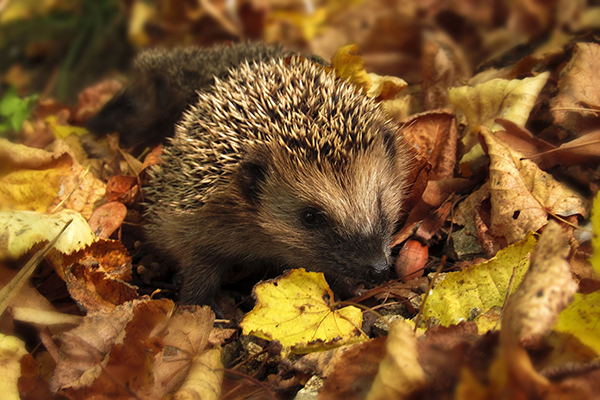 Check if Hedgehogs have been spotted on your street and register any hedgehogs you see here. Recycled pallets are ideal for making a hedgehog hotel because they are sturdy, aerated and exactly the right height for your little woodland friends to sneak in and out of. Hedgehogs hibernate in the winter, they need a safe spot to wait out the winter in away from predators, so correctly insulating and securing your hedgehog hotel is paramount. 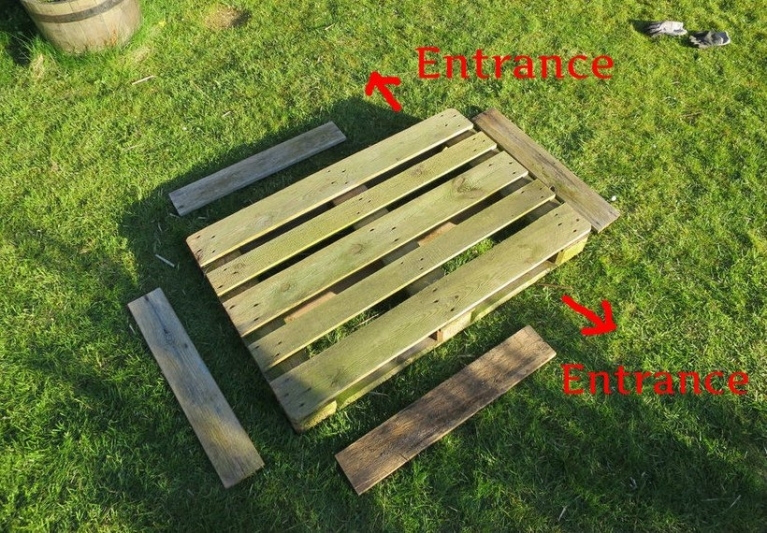 This blog article gives you a great step by step guide to building a pallet hedgehog shelter. You’ll need a pallet, some extra loose boards and a few other garden basics to make your hedgehog hotel. This is how it should turn out, not the prettiest, but every king has his castle, and your local hedgehog will love this 5 star getaway! Remember to point an entrance towards your windows so that you can keep an eye out to see if your hotel is at full occupancy. And you can learn more about hedgehog care on the Hedgehog Street website. Unlike hedgehogs, squirrels do not hibernate, meaning your squirrel shelter can be enjoyed year-round! They do, however, dislike bitterly cold days, and so usually hunker down in a den and sleep-in a lot during the winter. Squirrels are entertaining creatures to watch in your garden, they are sociable and some interesting behaviours can be witnessed relatively easily, making them a great candidate for an AutumnWatch pallet project! 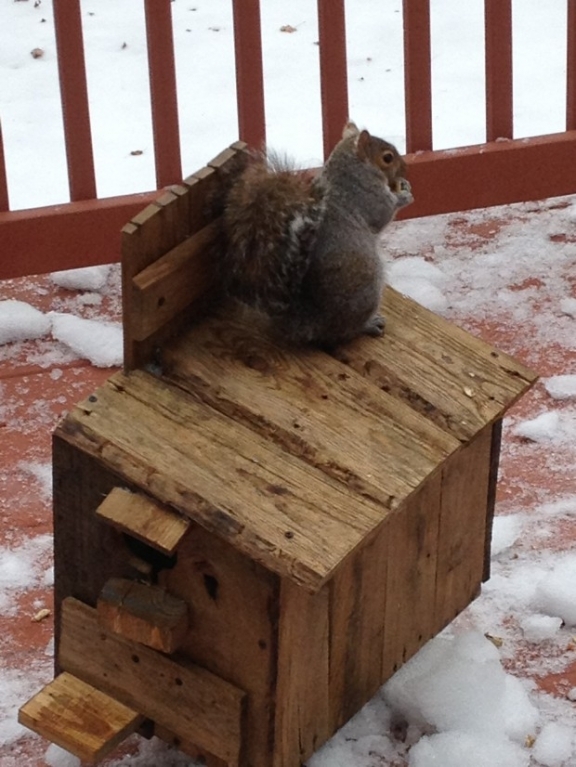 Recycle a pallet and turn it into an eco-friendly, squirrel-friendly shelter. 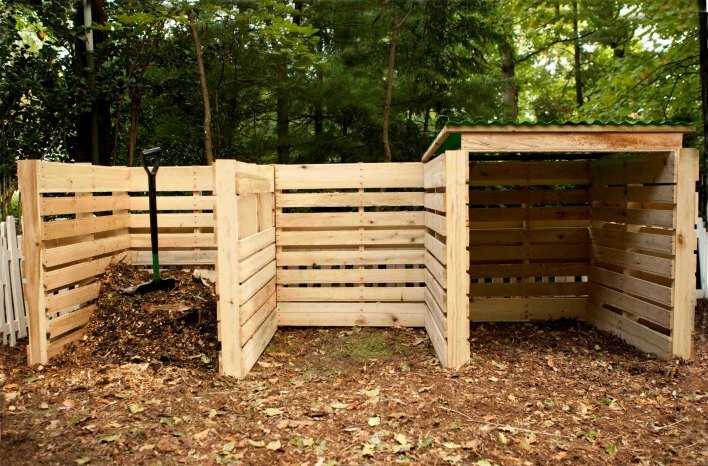 You’ll need a pallet and some basic tools, plus a few treats to entice your garden squirrels into the shelter. Check out the advice on this blog. I don’t know about you, but we are certainly happy to empty wine bottle for such a good cause! Every autumn and winter, wild birds need an extra hand to find enough food to get by, especially in towns and cities. So the kindest thing you can do for them is to help them out by providing a little bird bar! For this pallet project you’ll need a pallet, some basic woodworking tools, bird seed, and a clean, empty wine or glass bottle. 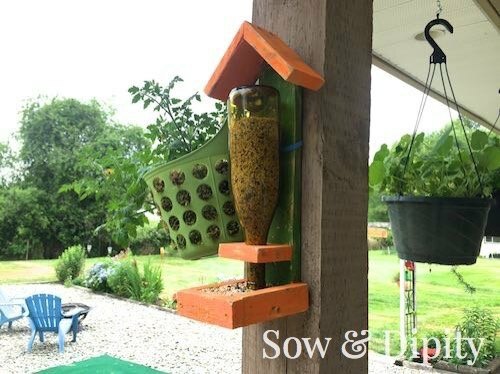 We love this design from Sow & Dipity’s blog, as you might be able to tell, this bird bar was placed under a sheltered area. So the only modification we’d recommend to make it suitable for all gardens is to extend the roof out over the seed collecting tray to help the seed stay drier. Again, be sure to position this one in your garden so that you can see the wild birds come and go! The RSPB website has a wealth of information, we’re particularly fond of this Bird Identifier Tool, take a look. We’re sticking with our feathered friends for this next pallet project. Autumn is the ideal time to clean out any bird boxes in your garden, ready for spring. But it’s also a great time to set one up for the first time! Building a bird box in Autumn means your feathered friends have time to give your new real estate a test-run ahead of nesting season in the spring and to use as a shelter from the cold and from predators until then. This lovely design incorporated a perch, bird box and hanging basket. But a word of caution, plant your seeds and then you must not tend to the resulting plans in the Spring, it’s important that the bird box doesn’t smell of humans in the nesting season as this can sometimes lead to birds abandoning their eggs or chicks. Having your own garden compost area is a brilliant way to help your micro environment, plus you’ll throw away less waste too! You can throw anything organic into your compost heap, so leftover bits of food, leaf litter and garden trimmings. And then come spring and summer you can use your very own compost to fertilise your garden again! There’s no need to spend a lot of money on your compost bin, in-fact recycled pallets make an ideal structure, it’s simple and easy! You can even call us and request a harder wood type to use for your compost bin. 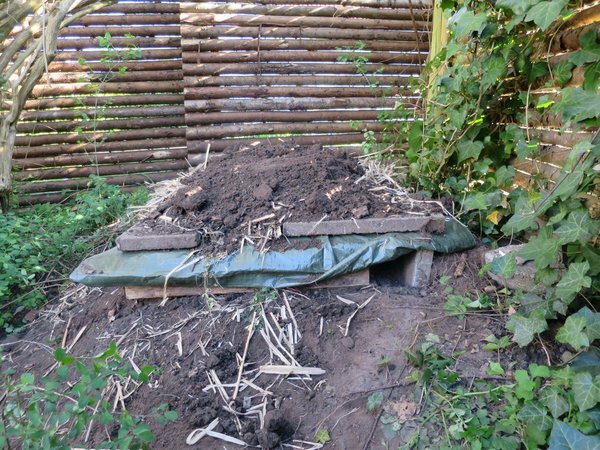 We think this compost structure from Joe Gardener’s blog using recycled wooden pallet is brilliant. Compost bins will also attract more wildlife into your garden: beetles, slow-worms, toads and centipedes love compost heaps, read more about making your own compost bin here. If you’re looking to get closer to the action, maybe you need a hide? A hide is a simple structure to help you discretely watch out for autumn garden visitors, and pallets make the perfect material to make an easy, small hide out of. 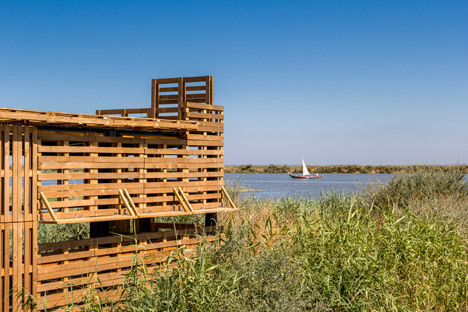 This example from Portugal is obviously a pretty big structure, but it’s easy to see how you can simplify this idea, secture a few pallets together and set yourself up with your camera and a thermos of cocoa! Remember, discarded pallets are just that – discarded. You can’t be sure what might have been spilled on them or if they’ve had chemical treatments applied, but we can! 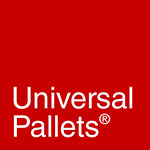 We specialise in providing affordable, safe and documented pallets for your pallet projects. So while most blogs advocate picking up discarded pallets, we’d like you all to know that a safe alternative is available from as little at £2.50 each on our website. Tune in to AutumnWatch this month! It airs tonight (15th October 2018) on BBC2, or you can catch-up on iPlayer!